Today I discovered that a project I have been working with is not able to sync with my SVN repository. This is because I moved disk partitions of both the repository and the project recently. I should have known. Rename the root directory of the project. Checkout your project to the same directory that the 'rogue' project is in. Open 2x explorer windows side-by-side and go into each respective project folder - so your seeing the contents of each of the project folders, one in each window. Select everything in the rogue folder, RIGHT click and drag to the window with the legit checked-out project in it. 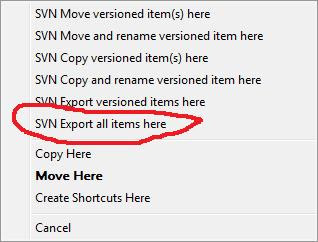 Select the "SVN Export all items here" option. You can safely overwrite everything when prompted, because it's all unmodified stuff straight out of your repository. 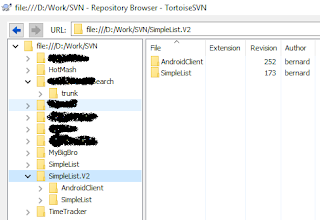 Now you can check everything in and your SVN repository is happy again!